Anyone who has been following the posts on this site, on traditional careers versus innovative work of your own, will be under the reasonable impression that as far as writing goes I value non-fiction over fiction. That if asked which form is the better manner in which to transmit ideas I would plump for essays detailing thoughts and opinions in as exact a way as possible over imagined stories whose meaning is as much down to the reader as it is to the author. 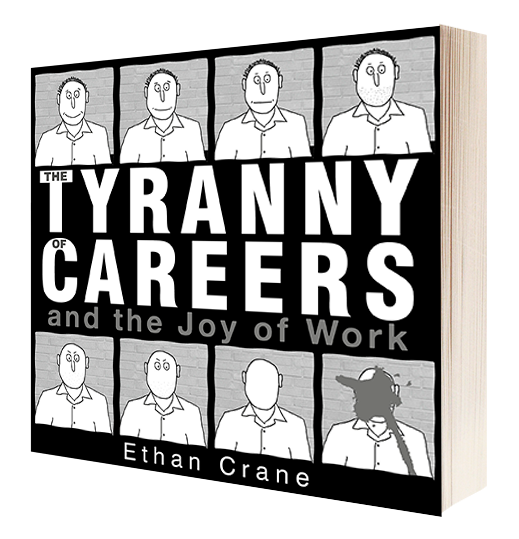 But all through the past year or so of writing The Tyranny of Careers I’ve felt a certain uneasiness whilst writing: that this non-fiction, this writing down of clear thoughts, is not what I most want to be doing. That if I were to be honest what I’d really like is to finish and publish (in whatever form) a novel – not clear thoughts, but opaque stories, from which meaning must be unearthed. Why should fiction be valued over non-fiction? I don’t think I’m wrong to say that fiction writers are more celebrated than non-fiction writers, are more famous and receive more accolades. And yet fiction writers appear in some ways to have it easier – they have more scope to almost cheat on delivering meaning to a reader because they can be more opaque in their writing, yet they are hailed for being more literary, for not laying the meaning of the story out too clearly. This is slightly facetious of course. Because the best fiction transmits its meaning to the reader in a magical way that non-fiction cannot do, and this is not an easy task at all. But I think there is another reason why fiction is celebrated over non-fiction, and that is to do with how we like to learn new stuff. We do not really like to be instructed. We like to come across meaning for ourselves, almost by accident. To feel that we are communing with a novelist through shared experience rather than being told an opinion by an essay writer. It is a sensation equivalent to the increased pleasure of hearing a favourite song by chance on the radio rather than choosing to play it ourselves. The reason why marketing diminishes creative work, by telling us (in trailers, in reviews, in quotes) why we should enjoy this particular piece of art. Of course I am making these points in non-fiction blog essay, still in a telling-people-what-to-think kind of way, rather than allowing-to-discover-for-yourself kind of way through fiction. So I have to do something about that. It’s time to go back to wondering what kind of fiction I’m able to write, whilst this draft of The Tyranny of Careers is waiting on notes from readers. Enter some short story competitions, try to finish a novel-length story (which is the story that I’ve wanted to be published above all others). Read lots more fiction myself. I needed this careers advice when I was sixteen. I needed it when leaving university, and again aged thirty, since I did not understand it until then. Such advice is not available at school, which focuses on just one way of living, that of the full-time career job, and so is of limited use. Not only of limited use, but also demoralising: it gives you a distorted view of the working life of adults, and of the possibilities open to you. A sixteen-year-old needs advice beyond how to obtain a nine-to-five, full-time job with benefits and pension. They need to know that there are other alternatives: that there is a working life that allows you enough spare time to use your genuine capabilities, and discover the pleasure in using these capabilities. In my experience it is people with this kind of life who are happier. So here is some careers advice addressed to the sixteen-year-old me. The full-time career is not the only future available to you. When asked the age-old question, ‘what are you going to be when you grow up?’, the answer you presently think correct actually answers the question, ‘what work are you going to do to earn money to eat?’ The question you ought to answer is, ‘if left to your own devices, what do you most dream of doing?’ Not to earn money, just to do for its own sake because this is where your genuine capabilities and interests lie. This is advice on how to live according to the second question. In twenty years time you won’t have what your school would call a career. You will have part-time work for which you’re paid enough money to live as you need to, leaving you enough time to investigate the activities in which you are really interested. Look at the job description in an advert for a career job: many claim that the job is ‘exciting’, ‘rewarding’, ‘fulfilling’ or something similar. It won’t be. Such claims seemed doubtful when I first read those adverts, and I now have plenty of evidence that this is false. In his book Outliers, Malcolm Gladwell gives his necessary criteria for a satisfying job: autonomy, in that you decide the tasks you perform and when you perform them; complexity, in that the work is not dull and routine; and a sense of reward for a job done. It is the last, the sense of reward, that modern careers pretend to provide but do not. This is a big loss. Many (though not all) well-paid career jobs provide autonomy: an account executive who develops new mobile phone contrtacts will decide who she does business with and when and where her meetings are held; and career jobs almost always provide complexity: gambling on the futures markets in the City is more complex and intellectually stimulating than the corking of wine bottles on a production line. But the sense of reward for a job done is seldom provided for. Companies provide one kind of reward: the payment of a salary. But this is only a substitute reward – it is not the same as a genuine reward for the job done. To feel the kind of reward that makes a job satisfying you must be able to view the end product of your work as something in which you are proud. Are you going to feel genuinely proud of working as a teller in a bank, of balancing the accounts for a multinational corporation, or being a producer’s assistant on a reality TV programme? But, you say, is there not still enough satisfaction to be had in completing goals in a career job, even if they are set by an employer? They are still goals. No. You become vaguely aware of this months after starting work, and it becomes clearer as the years go by. Goals set by other people cannot truly satisfy, because deciding these goals yourself is an important part of the sense of reward. Right now do you really count building a website to sell insurance products, or even writing policy advice for a government department amongst your goals in life? Are these activities which use your genuine capabilities and in which you are truly interested? You may have little idea of the nature of your genuine capabilities at the moment. But do you imagine that they coincide with those of any company? Companies substitute for this lack of genuine reward by trying to make you feel part of a company ‘family’, and by trying to convince you that the company’s goals are your goals. They send you on away-days with these family members that are labelled ‘team-building’, which sound like their primary purpose is to forge stronger relationships at work. But a company does not care about genuine relationships. Team-building exercises try to create stronger bonds between work colleagues, but only in order that you feel celebrated by your colleagues if you achieve for the company, and that you are letting them down if you don’t: a slave driver’s whip of emotional guilt. Team-building days feel awkward and false because they come from false motives – they try to form ‘friendships’ between people who would not naturally be friends. Your goals are not the company’s goals. A company’s only goal is to make money, for themselves. Ask people you know who have full-time career jobs how much they like them, how much they find them fulfilling. Watch carefully as they answer: judge whether you think they are giving a truthful answer. Many who answer ‘yes’ or ‘it’s okay’ are lying to themselves. It is a necessary survival trait to convince yourself, above anyone else, that your job fulfills you. Why else would you be spending thirty-seven-plus hours of your waking week working at it? What then, you already ask, are the goals that you should instead pursue for a satisfying life? Work satisfaction comes less from pursuing particular goals than from experiencing the pleasure of creative ideas. Ideas connected to your genuine capabilities, not to an employer’s demands. And although anything described as ‘creative’ is usually understood to be found in activities labelled ‘art’, the word ‘creative’ covers a much wider range of activities. We’ll return to this in a later part. But already, you object: all the career jobs described so far, they are not professions I would choose anyway. I want to be a doctor, or work for a charity, or be a zookeeper, a job where I might make a difference to the lives of others, and, as a consequence, receive a non-monetary sense of reward. Rewarding career jobs do exist, of course. But the demand for them is high, and this brings its own problems. Many people desire a career as a doctor, or teacher, or overseas aid worker, and with good reason: these jobs do offer a genuine sense of reward. But the competition for such jobs is fierce, and the entry requirements high. The entry requirements are not always academic – sometimes they are tests of endurance. To be a doctor you must study for four to six years, and then before you are fully qualified work for another two years as a junior doctor, when you are moved from hospital to hospital, uprooting your home life every few months. In the office of any charity, there will be many unpaid interns, and much more unpaid overtime than in, say, an insurance company. Many rewarding jobs have similar gruelling hurdles over which you must jump to obtain a position: they are testing to see if you will be able to endure the same pace when you start work. If your work has worth to you, but is controlled by an employer, that employer will, consciously or unconsciously, take advantage of your desire to keep the job, thus reducing its worth. Talk to many doctors and teachers and they say that the heavy commitment they make to their profession is not compensated by the sense of reward. Many teachers I know rarely have any kind of social life in the week because they are too tired. (I don’t subscribe to the idea that the long holidays in teaching make it worth the heavy work commitment. If you’re only in the job for the holidays, what happened to doing the job for the sense of reward?) There is a correlation: the greater the (publicly-perceived) sense of reward in a job, the more it demands of you. Is this a sacrifice you are willing to make? School careers advice tells you to ‘find a job that you love’. If you follow this advice, rather than ending up in a job you love, you end up in a profession that you used to admire at a distance. This is not the same as a job you love, and can often be the opposite. Teachers spend much of their time keeping children in line or adhering to teaching guidelines, rather than experiencing the joy of teaching. Jobbing journalists only occasionally have the chance to pursue stories that they truly think important. Vets don’t spend all day petting animals. When the rewards are not as expected, the worker in the rewarding job tells themself: this is what I must endure, because I am helping others, and besides, someone has to be a doctor, or nurse, so I’m willing to let that be me. A culture of martyrdom is created. Whilst there are so many willing martyrs competing for rewarding jobs, the jobs continue to exploit. Why would they change? You may think: if these jobs are so bad, so exploitative, why do people continue in them? Two reasons: debt, and embarrassment. You invested thousands of pounds and years of your life in training to be a doctor/nurse/teacher, and whilst you were training you kept telling yourself the job would be easier once you were qualified and had more experience. By the time you discover the rewards are too few for the sacrifices, there is no turning back. Now your best opportunity to earn money to pay back these debts is to work in the profession in which you have trained. Are you going to throw that all away to start at the bottom in another profession, on much lower wages? And if you say to yourself that you are going to stay in this now-disliked profession only so long as it takes to pay back the debt, are you then, after five or perhaps ten years, going to chuck it all in, and start at the bottom again? It is unlikely. But a greater force is stopping you quitting. For some time before you started and all the time whilst you were training as a nurse, or a teacher, you were proud to tell others of your chosen career. A teacher is much more impressive and interesting-sounding than an insurance salesman. How will you feel about telling those same people that you gave it all up, when before you were so proud of what you were doing? Will you suffer many more years of misery in order not to have to tell them? Many people do. Rewarding work is still an option for you, but not as a full-time career. So what about jobs in the creative industries? Surely they can provide the pleasure of creative ideas? You ask: if satisfaction in work comes from pleasure in creative ideas, why not work in a creative career job? I can come up with creative ideas for an advertising company, or another creative media job and at the same time be paid generously. Aren’t people in these jobs using their creative capabilities? Not in the same way. Advertising is called a creative industry, and does require original ideas to sell its products. A public relations executive has to write creative copy to publicise their clients’ good or service. But their pleasure in this work is in the sense of, ‘I have satisfied my bosses/client and will be handsomely paid in return’. Not in the creative idea itself, because the idea does not have genuine value to them. Everyone has their own genuine personal values for what they like and dislike in books, in music, in food, in toothpaste. But your genuine values are of no use in a creative industry, and working in these professions in fact results in the suppression of your own personal views. The marketing executive in book publishing learns to declare all books they help publish as ‘fantastic’, regardless of their personal opinion. When they start the job this may feel odd to them, as they declare something good when in fact they think it rubbish. But they must do so, because this is the opinion they need to repeat in their advertising copy and press releases. Your opinions about books, about music, even about toothpaste are an expression of your values and personality. Being creative for a company means learning how to suppress your own values and personality. After a time the marketing executive who advertises processed food forgets that they themselves like to eat healthily and that their work contributes to others not doing so. To work for a company in this way, your values must become the company’s values. You must forget your own opinions of the company’s products, and later, you must forget that you have forgotten, or else go mad. I have worked for book publishers. Here you help sell books written by other people – it is not your books you are selling. The pleasure in creative ideas in book publishing comes at the point of writing the book, not in selling it. In helping to sell it you are merely making this book’s ideas available to the public. Even if it is a book whose ideas you think of vital public interest, something that happens very rarely, the author’s pleasure in their creative ideas will not somehow rub off on you. For this you need your own creative ideas. A full-time career in a creative industry does not provide you with pleasure from creative ideas. But maybe sometimes, you point out, there are creative jobs, where you truly come up with your own ideas, ones that you genuinely think have value. What about the designers of the book covers? It is true. Book cover designers do originate their own designs, ones they themselves value and in which they take pleasure. It is a short-term pleasure that is repeatedly quashed by the stress of deadlines, the criticism of editors and authors, and the constant interruptions of emails and phone calls. Many designers’ ideas come to them only outside of work, when they are left alone and have time to think, at a time when they are not being paid for their ideas. After a while they forget about trying to find artistic pleasure (the reason they went to art college and applied for their design job), and settle into drawing a salary just like any other careerist. Don’t squander the pleasure of ideas in a full-time career, however appealing it looks from the outside. The pleasure from creative ideas is found outside of paid work. But maybe you think this doesn’t matter, that you never thought of work as a place to use your genuine capabilities anyway. That if you have a job with a good salary you do not mind performing tasks dictated by someone else, because this salary will provide you with the means to pursue the things in which you are really interested.